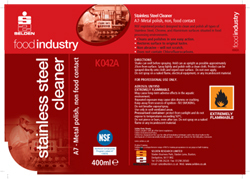 A NSF registered product designed to clean and polish all types of Stainless Steel, Chrome, and Aluminium surfaces situated in food processing environments. • Cleans and polishes in one easy action. • Restores surface to original lustre. • Non abrasive – will not scratch. • Does not contain Chlorofluorocarbons. Shake can well before spraying. Hold can as upright as possible approximately 20cm from surface. Spray lightly and polish with a clean cloth. Product can be sprayed directly onto cloth and wiped over surface. Do not over apply.